With the 2017 session of the New Mexico Legislature drawing to a close Saturday, people on different sides of the “wild horse” debate in Lincoln County and elsewhere in the state are pushing for passage of bills or memorials they hope will clarify the status of the herds that roam the Alto and Ski Run Road area. One side is focusing more on protection of private property rights and the other on protection of the horses and their freedom. The latest proposed legislation is House Memorial 102 introduced by State Rep. Joanne J. Ferrary, a Democrat from District 37, with input from Patience O’Dowd, head of Wild Horse Observers Association. Her organization won a temporary injunction against the sale of a dozen members of a “wild” herd hauled away and then returned to Lincoln County by New Mexico Livestock Board. The case is pending in district court. The memorial acknowledges the role of the conservation division of the state Department of Game and Fish in “protecting, maintaining and enhancing wildlife habitat,” and requests the division conduct an interim study and to provide recommendation for the protection, maintenance an enhancement of wild horse herds and habitat in the state. The memorial notes that the state has not managed the population of wild horses by immunocontraception in the last 10 years despite public policy, and contends management more likely would occur if a specific state agency had jurisdiction. Several tribes and pueblos already are managing wild horse population by immunocontraception and officials with two nongovernmental organizations as well are trained to administer the drug by darting, the memorial states. Fewer than 300 wild horses are on federal and state grazing lands in New Mexico compared to half a million cattle, it contends. A long list of stakeholders in the well-being of wild horses included artists, outfitters, horse rescue groups, rural economic development organizations and the state tourism, the memorial states. The New Mexico Livestock Board has exercised control over the wild horses of the state, considering them to be estray livestock subject to capture and disposal by the board, but the conservation services division is better suited to determine the status, needs, habitat requirements and issues of human interaction with wild horses than the board, according to the memorial. 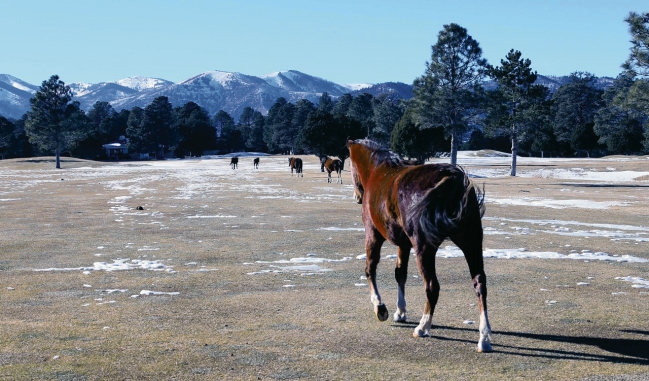 After tangling with the livestock board over horses in Alto and Placitas, wild herd advocates also seem to lack trust in the livestock board’s intentions, a significant impediment. The legislature’s website listed the memorial Tuesday as referred to the House State Government, Indian and Veterans Affairs Committee. O’Dowd insists that advocates for the well-being of the wild horse herds can no longer support Senate Bill 126, introduced by State Sen. Pet Woods, a Republican from District 7, if they claim they are against the slaughter of horses. The amended bill passed the Senate 32-2 and was sent to the House State Government, Indian and Veterans Affairs Committee. The bill classifies horses as livestock, but defines a wild horse as unclaimed without obvious brands or other evidence of private ownership determined by the board to originate from public land or federal land or to be part of, or descended from a herd that lives on or originated from public land. Excepted are horses that are subject to the jurisdiction of the federal government pursuant to the federal Wild Free-Roaming Horses and Burros Act and those determined to a Spanish Colonial horse. Captured horses could be relocated to a preserve, adopted or humanely euthanized. A herd could be removed from a range, if the range improvement task force of New Mexico State University makes that recommendation after evaluating the condition of the rangeland in response to a request from the livestock board. One of the key players in the situation with the Alto herd contends whether the horses there came from the reservation or from the wilderness area of the national forest is irrelevant, because both are federal land. She contended it is “highly unlikely” anyone is going to complain about horses on public land unless someone is injured on the highway. She also noted that the state fence-out law does not mean that a person must have a fence, but if an owner does not put up a fence, and cattle or other livestock enter the property and cause damage, the owner then cannot register a legal claim for damage reimbursement. Genetically verified Spanish Colonial horses are considered valuable by breeders, she said. Few have been verified in New Mexico. Senate Bill 126 also addresses testing to determine if a captured horse is of Spanish colonial heritage and if it is, to relocate it to a state or private wild horse preserve created and maintained to protect Spanish colonial horses. “If not, (the bill reads that) it shall be returned to the state public land, relocated to a public or private preserve or put up for adoption by the agency on whose land the wild horse was captured,” she said. The livestock board is the proper agency to manage wild horses and livestock, she contended. Other pending legislation includes House Bill 390, introduced by State Rep. Nathan Small, a Democrat from District 36, which would allow an equine rescue group first chance to purchase an unclaimed estray horse or it will be euthanized, later amended to allow public bid. Advocates contend that bidding would include buyers headed to a slaughter house. The amended bill was passed by the House 50-17 and referred to the Senate Conservation Committee. The initial aim of the bill was to prevent cruelty to livestock, advocates say. House Bill 284, also introduced by Woods, hasn’t moved from the Senate Conservation and Senate Judiciary Committee referral. That bill deals with trespass on private land by horses, giving the Livestock Board jurisdiction and clarifying procedures to be followed when wild horses come into the custody of the board, including adoption, relocation to a preserve or euthanasia.